A few years ago, one of my friend’s sons called her from his university dorm because he didn’t know how to boil an egg. When she got off the phone with him, she repeated the conversation for those of us in the room. She laughed and shook her said, saying how incredibly funny it was that her son didn’t know how to cook a single thing – not eggs, not pasta, nothing. I didn’t say anything at the time, but I felt so incredibly sad for this young man. 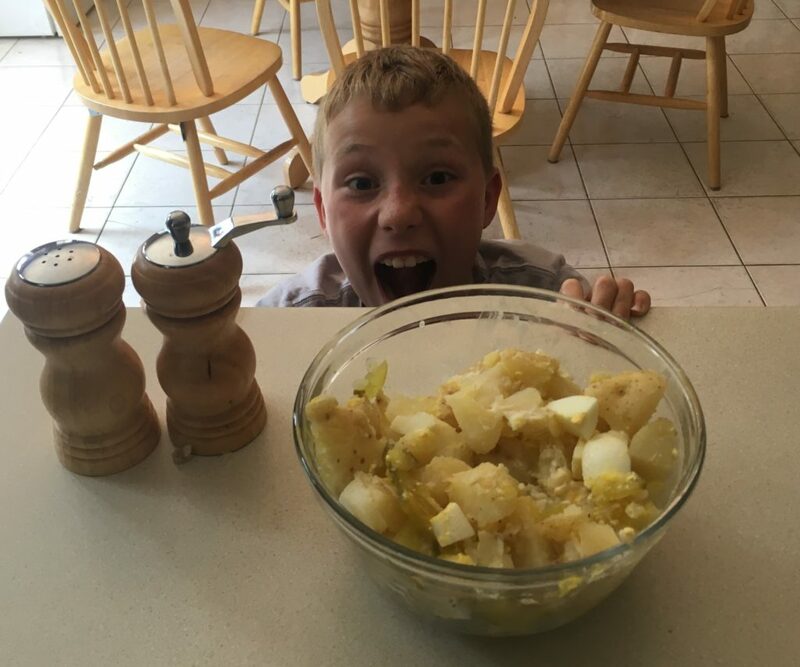 My kids were only preschoolers back then, but I vowed right there that they would not leave my home without having basic life skills – including cooking. They don’t need to be gourmet chefs unless they want to be, but they do need to know how to feed themselves nutritious food that tastes good. 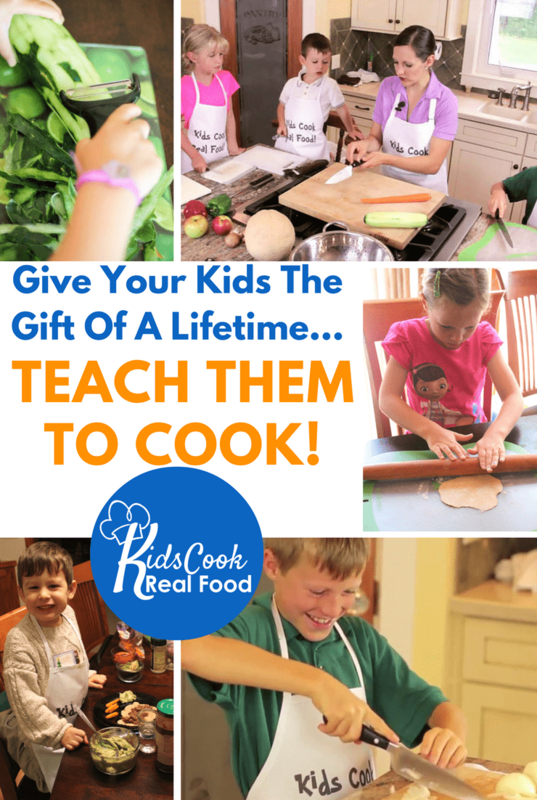 Over the years, I’ve had them in the kitchen with me here and there, but it wasn’t until I found the Kids Cook Real Food eCourse that I really started to feel like we were on the path to mastery in the kitchen. Course creator Katie Kimball is brilliant in how she’s laid this out. Kids ages 2-teen can work the lessons at the same time, making something that the whole family can eat, but everyone has their own age-appropriate skill that they are working on. This course is the best thing I’ve bought in a long time. What does this have to do with French? 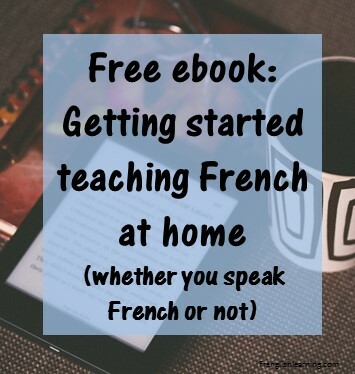 On this blog, I talk about French resources. 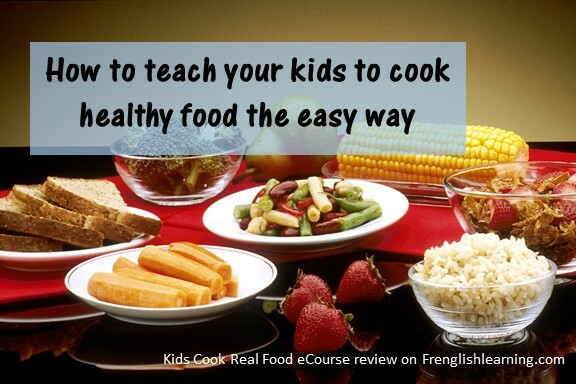 The Kids Cook Real Food eCourse is in English. We speak English while we do the lessons, but then we practice the skills we are learning by following recipes that are in French. Each week I choose one and we make it. That means we’re in the kitchen together at least twice – once for the lesson for this course and then again to make our French recipe. I wrote more about how I find recipes to make here. If you’re looking for a way to teach your kids to cook great food, this is the course you’re looking for. Get it here. 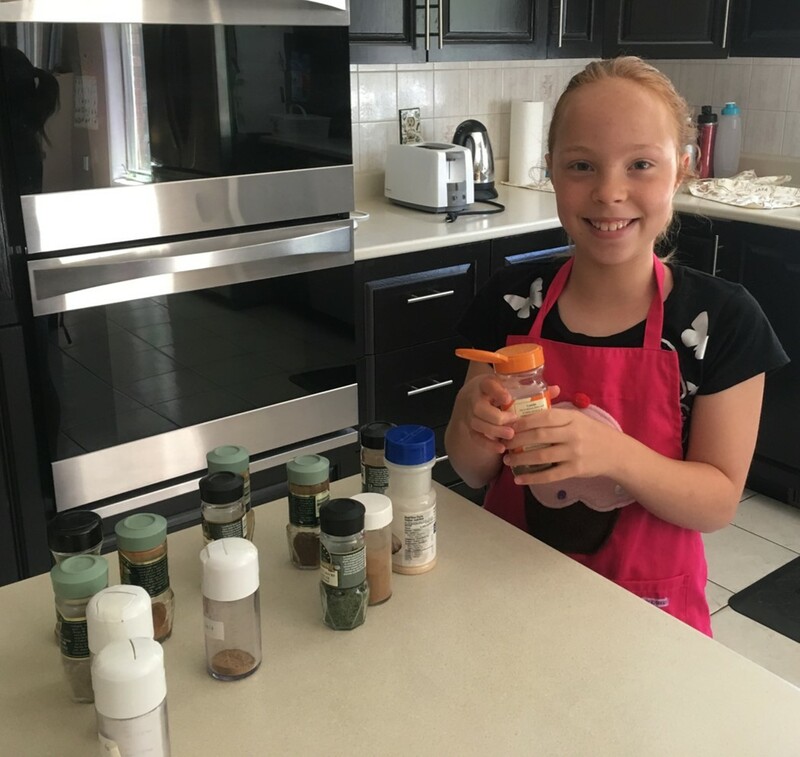 Kids Cook Real Food is an on-line video course with 3 levels – beginner, intermediate and advanced. Levels can be purchased individually or all together (lower price to buy them all, of course). You can choose one-year access or upgrade to lifetime access. Each level has 8 lessons. Each lesson teaches one or two skills with professionally-produced video lessons, pdf downloads, flashcards, and other tools. The video part of the lesson takes 10-15 minutes and the kitchen time is usually 15-30 minutes, depending on the lesson. I decided to buy all 3 levels of the course in May. At ages 10 and 9, my kids were older than the target age for the beginner level, but I still decided to start there. I wanted to make sure that we weren’t missing any skills. I figured that the easy lessons would build their confidence and we’d still end up with something great to eat when we were done. It was the right decision for us. We’ve done one lesson per week for most weeks over the summer and have just finished the beginner level. Some of the skills taught were review but others were brand new. My children benefited from the practice for all the lessons, and I picked up some great time-saving tips along the way. This fall, we’ll continue our one lesson per week pattern with the intermediate level. If we miss a week here and there it’s no big deal because the course is self-paced and flexible. I chose lifetime access to the videos so we wouldn’t be time-pressured. We will probably be able to finish all 3 levels within the one-year time frame, but I didn’t want the time pressure in case we need to take a break for a while if when our schedule gets overloaded. I prepare for the lessons by watching the parent guide video & and scanning the related pdf the day before we usually grocery shop. The list of ingredients needed for the lesson is clearly labelled and I make sure those items are on my shopping list if I don’t already have them. I look at our calendar for the week and schedule the lesson for a day that makes sense time-wise and also food-wise. For example, for the salad lesson, I put it on a day when we were going to need a fresh salad with supper. Sometimes I have to move the lesson to a different day when things come up, but that still works out fine – once we have the ingredients, we can do the class whenever it fits. The food is healthy and suitable for most eating plans. So many kids’ cookbooks have sweet-laden treats glossing their pages. Fine for occasional treats, but not useful for everyday life. This course has food that is good for you. If you have special dietary needs, the recipes used will probably still fit for the most part, possibly with minor modifications. All but 2 recipes are already gluten-free, and substitutions are given for many allergies/special requirements on the FAQ page. My kids love it. It’s not a fight to get them to do it – they are excited when they know we’ve got a lesson on the list for the day. Even my youngest, who isn’t the easiest to please, really likes Mrs. Kimball. He says that he can tell that she’s trying to make it fun and he likes to watch her and her kids demonstrate on the videos. We all remember what she says. She gives tips that are easy to remember because of the way they are presented. It’s organized well. The skills follow a logical order and are age-appropriate. Multiple ages work together on the same lesson, but still learn at their own level. Quick recovery of my time investment – I am able to get my kids using the skills they are learning right away, saving me time. Instead of needing help with their snack, they can get it themselves. When we were frantically trying to get out the door to go camping a few weeks ago, my oldest washed all the produce while I chopped, cutting my time in half. They’ve even made my lunch a few times now. Life preparation – I am confident that we are on our way towards meal preparation proficiency. Obviously we’re not there yet – they are still young. However, I can relax knowing that by the time they move out, my children will know how to cook everything they need – including boiling eggs. This entry was posted in 0-3 years, 11+ years, 4-6 years, 7-10 years, Advanced, Beginner, Bilingual parent, Immersion, Intermediate, Other, Parent speaks no French, Parent speaks some French by Leanne. Bookmark the permalink.